Outside my window…it’s grey and snowy, but not as cold as yesterday, thankfully! I’ll still need to put on some long undies for my half hour dog walk later this morning! I am thinking…about being alone today, the first time in a long time where I have no-one at home to nurse, supervise, listen to, or otherwise occupy! I am thankful for…yesterday’s outing with my SIL and nephews, and the chance to be around little ones again, to put them in pyjamas, read a book, sing a few songs, and turn out the light. But maybe not EVERY night, LOL! I am learning… how to be disciplined in my diet, goals, and to-do lists. It feels good to have things (more-or-less) under control. From the kitchen…I have ton of old bananas in the freezer to whip into bread and cake. Plus I found a great-looking soup recipe in today’s paper that I”m going to make for supper: Spicy Fava Bean Chickpea Noodle Soup. I am wearing…black screen-print long-sleeved tee, black cords, cozy slippers. I am creating…a home management system to keep the housework under control. I”m using the Task Pro app on my iPhone. I am going…to see Quartetto Gelato and Ethel at Koerner Hall this Saturday night, with Z and Michael. I am reading...Logicomix: An Epic Search for Truth by Apostolos Doxiadis and Christos Papadimitriou and The Cure for Death by Lightening by Gail Anserson-Dargatz. I am hoping…for a productive week, that my blood pressure continues to stabilize, and that I continue to shed some pounds! I am hearing…nothing. Ahhh. Peace. Around the house…I want to work on our master bedroom this month. We desperately need new window treatments as the old ones were left by the previous owners of the house, are unattractive, faded, dusty, and the suspension system is failing (they’re balloon shades). My plan is to get a new duvet cover/sheet set and then pull colours for paint, window treatments, and accessories from that. One of my favorite things…sitting reading the paper with my (single cup of) coffee in the morning and my dog curled up beside me. Here’s my dog Wilson with his coat and boots! 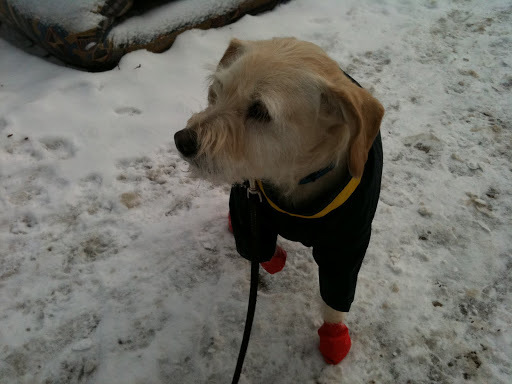 The boots are like thick balloons…they’re called Pawz and protect his feet from the salt and chemicals on the street. The coat is to keep his fur clean on our walks! Head on over to The Simple Woman’s Daybook to read other participants thoughts!